Founder of the Schiller Institutes, Helga Zepp-LaRouche, delivering the keynote address to the June 25, 2016 Schiller Institute conference in Berlin, Germany. 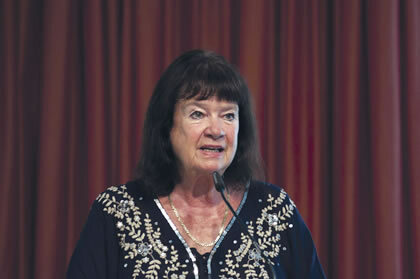 Helga Zepp-LaRouche, Founder of the Schiller Institute and President of the Schiller Institute in Germany gave the keynote address to the International Schiller Institute Conference “Creating a Common Future for Mankind and A Renaissance of Classical Culture” in Berlin, Germany on June 25, 2016. Her presentation was entitled, “The Future of Mankind Will Be Beautiful—Provided We Can Avoid the Fate of the Dinosaurs.” This is an edited transcript. Ladies and gentlemen, distinguished guests, dear friends of the Schiller Institute: I think we all have come to this conference because everybody who is in this room knows that we are experiencing an absolutely unprecedented, systemic and existential crisis of civilization. We have the coincidence of a war danger, where NATO is confronting Russia in a very, very aggressive fashion—which could lead to a Third World War. We have a U.S. confrontation against China in the South China Sea. We have the danger of a new 2008 type of financial crisis, which could blow up the financial system, and naturally we had, two days ago, the Brexit—Great Britain voting to leave the European Union. And as we all know, this was not a vote against Europe as such, but it was a vote against a completely unjust system and a corrupt elite. This conference has one topic, or one subsuming topic, and that is to define solutions to these crises: to discuss what would be the new paradigm, and is mankind capable of solving such an existential crisis? We have distinguished speakers from four continents, from many countries, and obviously these are the people, or they are representative of the kinds of people, who are determined that a solution is to be found. Before I go these various mortal dangers, the solution is easy. So be at rest and calm. If mankind unites for a good plan and acts in solidarity with courage, any crisis in human civilization can be overcome, because that is the nature of human beings—that when we are challenged with a great evil, an even greater force of good is awakened in our soul. Now I will talk about that, but let me preface it by saying that maybe this Brexit is a blessing in disguise. Because it is a vote against a supranational bureaucracy, a soulless Brussels dictatorship. It’s a vote against robbery of national sovereignty, against a completely heartless European Union Commission, which has been completely alienated from the people in Europe, a European Union which has no unity. It has no humanity. And the Brexit creates the opportunity to build a completely new Europe. 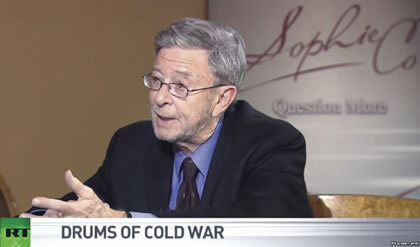 Prof. Stephen F. Cohen, Russian expert at NYU and Princeton. I remember at a Schiller Conference in 2003—this was the day the Iraq War started—I prefaced my speech by saying, “Are these people insane? Don’t they know that, by attacking a country on the basis of lies, they will call forth the Erinyes, those goddesses of natural law, who may not act immediately—but there is a higher justice which corrects things.” And I find it a historical irony, if you will, the connection between the British voting against the EU membership, and the connection to the illegal war against Iraq. Remember that it was the Iraq war that was one of the root causes of the refugee crisis, one of the root causes of Europe being in such distress, and now, of all people, the British people are voting something which is the destruction of the British Empire, and may lead from a Great Britain to a very tiny Britain, namely if Scotland and Ireland leave. I think this is a higher justice, and the proof that nemesis is a force in history. Let me focus on the underlying danger, which is not eliminated by this, but, as I said, it creates new openings to find a solution. We are sitting on a powder keg, and any of the different strategic crises right now could be the trigger of a thermonuclear war. There are many people—not many, but at least some people, military experts primarily—who have said that we are now in a situation which is more dangerous than during the height of the Cold War. That was naturally the Cuban Missile Crisis. After this war danger had been present for a variety of reasons for a long time, only in the most recent days have people suddenly begun to speak about it. German Foreign Minister Frank-Walter Steinmeier—he talks about the NATO maneuvers in the Baltics as war cries and saber-rattling. Wolfgang Ischinger, head of the Munich Security Conference and a staunch Atlanticist, says there is the danger of an escalation into a military confrontation. NATO must tame itself. NATO must tame itself, he says. Gernot Erler, Germany’s Special Coordinator for Russia Policy, says NATO is escalating the situation up to a war; it should stop. Professor Steven F. Cohen, a Russia expert at New York University and Princeton: The United States is the biggest threat to the world, and if the Obama administration were to do what the 51 State Department dissenters who just published an open letter to Obama said—namely to topple Assad—within a short period of time ISIS would sit in Damascus, and the United States would be involved in a war with Syria, Iran, and Russia. Then you have, between now and the July NATO Summit in Warsaw, five NATO maneuvers at the Russian border in Poland and the Baltic countries, involving between 50,000 to 60,000 troops combined. Simultaneously the United States is moving aircraft carrier strike groups into the Mediterranean, warships of the Aegis class into the Black Sea, and other U.S. warships into the Baltic Sea. Four battalions will be put in the Baltic countries after the Warsaw Summit. There is a full arms race going on, with modernization of all nuclear arsenals on both sides. The same dynamic with different predicates is essentially happening around the South China Sea, between the United States and China. There was no problem in the South China Sea until the government of the Philippines, in a clear violation of international law—that is, the previous Philippines government—pushed by the United States, took the territorial dispute to the Court of Arbitration in The Hague. The United States, under the pretext of freedom of navigation of the seas, is now continuously violating the 12-mile zone, overflying Chinese islands and reefs, and the propaganda line for both—the two conflicts, with Russia and China—is that Russia illegally occupied Crimea, and that China is involved in aggressive land-grabbing of islands in the South China Sea. And that all the moves by the United States and NATO are only in response to the aggressive behavior of Russia and China. That is a complete lie. The question to start from is, How is it that 71 years after World War II ended, when a world in ruins made a solemn commitment “never again,” “never again genocide,” “never again war,”—how is it that 25 years after the disintegration of the Soviet Union, we are now at the verge of World War III? President H.W. 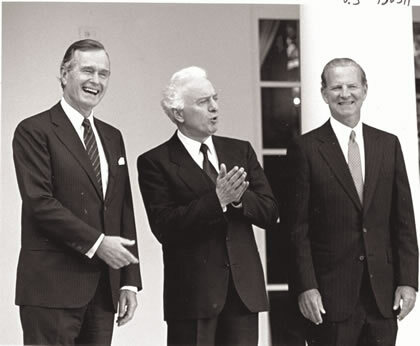 Bush, Soviet Foreign Minister Eduard Shevardnadze, and U.S. Secretary of State James Baker in Washington, D.C. on Sept. 21, 1989. This was the key element in why Soviet President Gorbachov agreed to the unification talks. Sure, there was no formal deal made, but there are many eyewitnesses, former U.S. 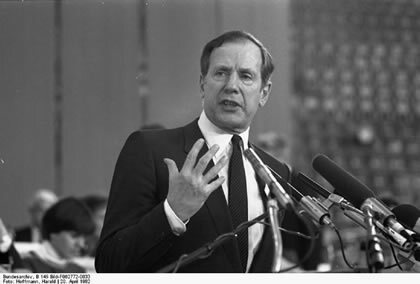 Ambassador to Moscow Jack Matlock and others, who say that Baker gave the promise on May 18, 1990, that the United States will cooperate with the Soviet Union for the development of a new Europe. In June 1990 Bush promised Soviet leaders that the United States would work toward an inclusive Europe. Now it is clear that, at the same time that these promises were given, the neocons in the United States were working on the Project for a New American Century (PNAC) doctrine. It declared that with the collapse of the Soviet Union, the United States would insist on a unipolar world: namely, that it would not allow any nation, or any group of nations, ever to surpass the power of the United States, economically or politically. In the middle of the 1990s, East European countries, former members of the Warsaw Pact—Poland, Hungary, the Czech Republic, the Baltic nations, and others—were ushered into NATO. Yeltsin, Medvedev, and Gorba­chov protested against this, both privately and publicly. The United States violated the no-eastward-expansion agreements with Russia and went for regime change. Victoria Nuland admitted publicly that the State Department spent $5 billion on the color revolution in Ukraine alone. Helmut Schmidt, the late Chancellor of Germany, said that the Ukraine crisis started with the EU Maastricht agreement, because that was the moment when the EU turned into an empire with the idea to endlessly gain new members, and that EU eastward expansion occurred in parallel with NATO eastward expansion. 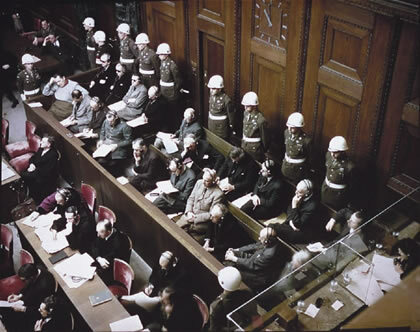 Defendants at the trial at Nuremberg. What triggered the Ukraine crisis, and therefore the crisis with Russia—which was already building,— but what formally triggered it, was an event at the Vilnius EU summit in late 2013. The EU proposed to establish the Eastern Partnership project and associate Ukraine with the EU. At the last moment, Ukrainian President Yanukovych recognized that that would give NATO access to Ukraine, and would open Russia to all European Union products, and that would be ruinous for the Russian economy. So he opted out at the last moment, and then you had the activation of the NGOs, financed by the State Department; you had the activation of the Ukrainian Nazis in the tradition of Stepan Bandera. This led to the coup on February 22, 2014, and the referendum in the Crimea. It was not an annexation by Russia; it was a referendum by the majority of the people of Crimea, occurring in reaction to the fascist coup in Kiev. And that record has to be set straight, because unless we look at that chronology, we will be entrapped by the war propaganda that is leading to World War III. Now, in the meantime, quite some years ago, the NATO doctrine was changed from Mutually Assured Destruction—which was the idea that nobody could use nuclear weapons because it would lead to the annihilation of mankind—to the utopian conception of a winnable, limited nuclear war. That is the basis for NATO’s current Prompt Global Strike. This is the logic behind the establishment of the U.S. anti-ballistic missile system worldwide. That that system does not have the function to protect against Iranian missiles, should have been clear after the successful P5+1 agreement with Iran. That idea of a winnable first strike is also the logic behind the Air Sea Battle doctrine against China. The same Obama who promised in 2009 that he would work to get a nuclear-free world, has committed $1 trillion for the modernization of all U.S. nuclear arsenals, such as the B61-12 warhead, of which there are probably 200 stationed in European countries. The idea is that these modernized tactical nuclear weapons are more usable, because you can put them on stealth bombers, and break through the air defenses of your opponent. So that’s the case with the long-range stand-off weapons, the LRSW. Sen. Dianne Feinstein and Undersecretary for Arms Control and International Security Ellen Tauscher—in their open letter in the New York Times several weeks ago—wrote that these weapons systems should not be built, because they greatly increase the danger of nuclear war by blurring the line between conventional and nuclear weapons. The whole idea, in this day and age, to build new nuclear weapons is unnecessary, costly, and dangerous, they say, and I would say it is criminal, because it is part of preparing a war of aggression which, in the Nuremberg Tribunal, was declared to be the highest crime against humanity. So that’s the situation. And the thing that drives me absolutely crazy, is that you have a situation which is more dangerous than during the Cold War Cuban Missile Crisis for a variety of reasons—because it involves thermonuclear weapons, the code of behavior between NATO and the East has broken down, there is no red telephone between Obama and Putin—so despite that, the public is sleeping! The people are sleepwalking again into world war, as they did in going into World War I. And one of the purposes of this conference is to change that, and get a public debate from our standpoint that we do not want to be part of this. 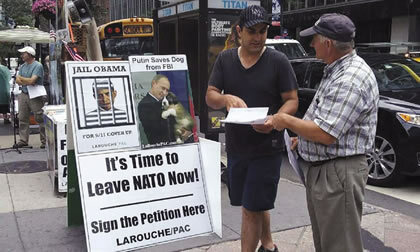 LaRouche PAC anti-NATO organizing in New York City in 2016. There is a second existential crisis which we all know: the immediate possibility of a crash of the trans-Atlantic financial system. Wells Fargo, Bank of America, and others are involved in the same practices as in 2008, by giving subprime mortgage loans. The too-big-to-fail banks all have gigantic bubbles in shale and oil gas. They have bubbles in other areas—cars. The only difference from 2008 is that all the instruments of the central banks have been used up. Lowering interest rates? Well, you can make it even lower,— negative interest rates. You can make people pay 10% to even deposit their money in the banks, which is almost what is happening. So, many businesses do not put their money in banks any more; they keep it either under their mattresses, or in their safes, or wherever. And then there is the idea of printing helicopter money; in response to the Brexit crisis, the Federal Reserve, the European Central Bank, and the Bank of England are working 24 hours around the clock to decide how much helicopter money they have to print to prevent a collapse of the system. That is just the end of it, and we have to come to grips with the fact that this system is absolutely finished. Now that, as I said, is no reason to despair, because the Brexit opens the way to join a completely new strategic system. The Schiller Institute has campaigned since 2013, when President Xi Jinping announced the New Silk Road, that that approach must become a global program for reconstruction for the world economy, and we published a study called The New Silk Road Becomes the World Land-Bridge. Look at what has happened since the announcement of the New Silk Road: In less than three years, this new system has developed an enormous dynamic. Now 70 countries are participating in the Asian Infrastructure Investment Bank (AIIB), a banking system associated with the New Silk Road. By the end of the year, it is expected that 100 countries will have joined this new system; 18 countries are already part of the Shanghai Cooperation Organization (SCO), which overlaps the BRICS and the New Silk Road. There are new banking systems, the AIIB, the New Development Bank, the Shanghai Cooperation Bank, the Maritime Silk Road Fund, the Silk Road Fund, the SAARC bank—that’s the bank for the South Asian Association for Regional Cooperation. 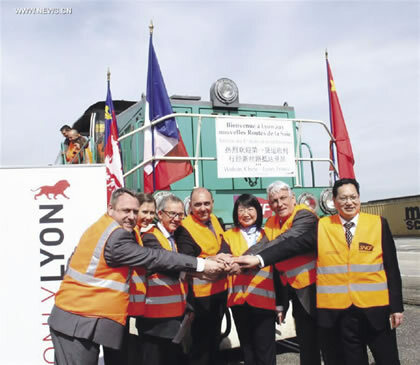 Chinese and French officials posing in front of the first freight train from Wuhan, China to Lyon, France, a 11,300 kilometer journey which passed through five other countries before arriving in France. And the Silk Road is progressing quickly. There are at present seven or eight new train connections between China and Europe, from Chengdu, Xi’an, Chongqing, Yiwu, and Lianyungang, to such places as Madrid, Lyon, Herne, Duisburg, Hamburg, and Rotterdam, and the number is growing. President Xi Jinping has been in the Czech Republic, in Poland, in Serbia, in Germany and France; everywhere he has been, the idea of cooperation with China and the New Silk Road has become a powerful dynamic. The President of Switzerland went to China. Austria wants to become a hub of the New Silk Road. Greece is joining the Maritime Silk Road—China is building up the port of Piraeus near Athens. Now China is building a rail connection between Budapest and Belgrade, which eventually will link up with the Maritime Silk Road at Piraeus by bringing more goods this way. President Pranab Mukherjee of India was in China and spoke very, very bravely about the India-China strategic partnership, so all this talk about big tensions between India and China—forget it, it’s all Western propaganda. When President Xi Jinping was in Iran, it was agreed that the Silk Road will extend to Iran. Shortly thereafter, Prime Minister Narendra Modi was in Iran, together with the President of Afghanistan, Ashraf Ghani, and they discussed not only the building the port of Chabahar—which will be a crucial element of the Silk Road, eventually going to India—but also Afghanistan’s desire to be a hub for building the Silk Road between China and Europe; in that way, Afghanistan will be reconstructed. In 2013 Xi Jinping invited all the countries of the world to join in the “win-win cooperation”; President Putin has offered, many times, the integration of Europe from the Atlantic to the Pacific, from Vladivostok to Lisbon. What Happened to the EU? Indian President Shri Pranab Mukherjee (right), with China President Xi Jinping, inspecting the Guard of Honor at the welcome ceremony in Beijing on May 26, 2016. OK, so how do we look at this situation, and how do we come forward? What spirit and what historical precedent is necessary to make it possible for European nations to enter into alliance with the Eurasian Economic Union and participation in the One Belt, One Road policy—to enter a new geometry? Well, first of all, we have to start with the realization that the EU, as it developed from the Adenauer-de Gaulle conception as a political union of nation-states, and as it was expressed in the original Elysée Treaty between Adenauer and de Gaulle, did not survive. When it was unfortunately modified in 1963 by means of a preamble, the modified EU then led directly to the Maastricht/Lisbon EU, and that model is over. It has failed, and considering the disgusting behavior of the [EU] Troika against Greece and other southern European countries, but especially how the EU dealt with the refugee crisis, you can see the complete moral collapse of Brussels. There is no more Schengen, it’s over! If you have barbed wire along the borders of the Balkan countries, there is no more open travelling within Europe, there is no unity within the European Union, no solidarity, and no solutions and no visions. The EU deal with Turkish President Recep Erdogan, to give this guy who’s financing ISIS to the present day, $6 billion, so that he can keep people in camps to prevent them from reaching Europe—and with no guarantees for the rights of these refugees—is absolutely disgusting and a violation of human rights. [applause] Doctors Without Borders was absolutely correct in refusing to accept any money from the EU because of this behavior. The emergence of right-wing populist to outright fascist organizations in Europe is the result of the failure of the European elites and their submission to the EU dictatorship. Ambrose Evans-Prit­chard, an MI5 mouthpiece in the Daily Telegraph, wrote a while ago that this EU of Brussels is exactly carrying out British policy. And what we are seeing in the EU is what Churchill always wanted. He wanted a united Europe, but with the British outside, so it could manipulate Europe from the outside, and then run the world on the basis of the special Anglo-American relationship. 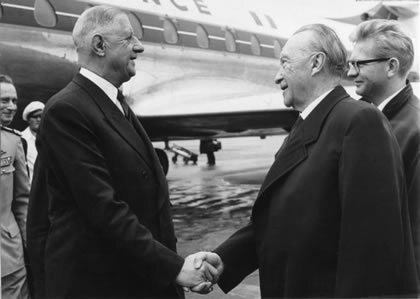 French President Charles de Gaulle (left), meets German Federal Chancellor Konrad Adenauer during a visit to Germany in 1961. The leaders signed a treaty that reconciled the French and German peoples to each other. In the summer of 1962, after Adenauer went to France and after the fantastic journey of de Gaulle to Germany, where he was greeted with absolute love and admiration, the two of them proposed a union without Great Britain. De Gaulle asked Adenauer, Are you prepared to work with France, if need be only our two countries? And Adenauer answered with a clear “Yes.” The union was the real goal of the Elysée Treaty of Jan. 22, 1963, and before that, of the Fouchet Plan. But unfortunately, de Gaulle and Adenauer lost the fight with the Atlanticists in the German Bundestag, and the Gaullists were outvoted in France. Adenauer at that time was already weakened, because Ludwig Erhard had already been designated as his successor. Then, on May 16, 1963, a preamble was forced through, which had the following elements: a close partnership with the United States; a common defense in NATO; Great Britain joining the European Economic Commission; a free-trade agreement, GATT. So the Atlanticists won, and that was the lost chance of Europe leading to the present crisis. It led to a very rocky road, but it is very clear that Europe must find some form of working together, and obviously, the City of London and Wall Street, which has always been a British dépendance, they are deadly opposed to such a solution. Klaus von Dohnanyi at the April 20, 1982 SPD Party Conference in Munich. Klaus von Dohnanyi, the former German Minister of Education under Chancellor Willy Brandt from 1972 and 1974, in a very interesting June 17 article in the Frankfurter Allgemeine Zeitung, discussed exactly this Adenauer-de Gaulle cooperation and that the original Europe Economic Community did not include Great Britain and had no clear integration into NATO structures. Nor did the European Commission or European Parliament have any real responsibility. It was the idea of a European fatherland of fatherlands; it was Germany, France, Italy, Belgium, Netherlands, and Luxemburg. De Gaulle wanted this European political union of sovereign states, and he was concerned that in any case, if it came to a serious crisis, the United States would only pursue its own interests in Europe. Klaus von Dohnanyi, in this article, writes that he, as the leader of a NATO exercise in 1979, found that upon the first Soviet advance into German territory, the United States used tactical nuclear weapons on German territory with no previous announcement; and that, by the way, was the situation in the entire Cold War period, and everybody who has studied the matter knows that. So that is essentially the situation today, as well. But even in 1950, Adenauer said in a famous interview with Kingsbury Smith, that a union between Germany and France would give significant new life and a powerful fresh impetus to the European idea. Dohnanyi says that even Helmut Schmidt, who supported the preamble at first, recognized in 1983 that it was a big mistake, and that without an alliance of Germany and France there can be no progress in Europe. So, can the German government, in light of the totally muddled situation, undertake such an initiative today? Dohnanyi says yes, it can, but the debate must come from the rank and file of society and the parties. The German-French alliance remains Europe’s destiny, but the only way to overcome the pessimistic mood in Europe is to go back to the two most courageous men after 1945—de Gaulle and Adenauer. It is perhaps a coincidence, but Foreign Minister Steinmeier has invited the six founding EU members to a summit in Berlin: Germany, France, Italy, and the Benelux countries. They say it was planned a long time ago, but I think this is very interesting. Now, having this historical frame of reference in mind, let’s look at the epistemological basis for a new paradigm. How can we get society to join in serving the common aims of mankind, to agree to rise above geopolitics and join in a global development partnership? Well, who is right? Is it those who say that geopolitical conflict must always exist, chauvinism against other countries is OK, xenophobia against other nations, even hatred against other ethnic groups? Well, I’ll tell you, the problem is that these people are thinking on a lower level, namely, on the level of sense-perception or Aristotelian logic and contradictions. To save mankind, we need a completely different level of thinking and I would like, for this purpose, to turn to Nicholas of Cusa, who was probably the most passionate proponent of an understanding among peoples, as an expression of the relation between the One and the Many, for which he developed a revolutionary, new method of thinking, which he called the coincidentia oppositorum, the coincidence of opposites. Nicholas says, “the whole universe precedes all other things as that which coincides the most perfectly, corresponding to the order of nature, so that each participates in everything. Quod libet in quo libet.” Concretely this means that each nation can be integrated into a higher, inclusive order without losing its characteristics, because the unity is already in existence before the multitude. 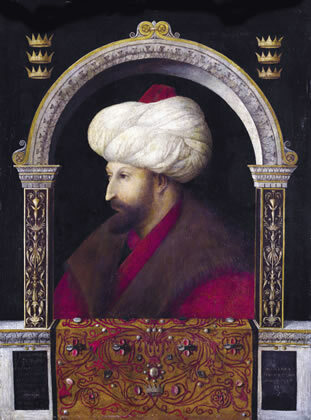 Portrait of Great Sultan Mehmet II, 1480. “Concordance is the highest form of truth,” Nicholas says in the Concordantia Catholica (Universal Concord). An understanding between different nations and religions is possible because they can all produce universal discoveries which can be replicated and recognized by all others. In Cusa’s The Layman on Experiments Done with Weight-Scales, he says that all discoveries made by one country must immediately be made available internationally, so that all others can access what had been hidden. Nicholas consciously broke with the axioms and the popular beliefs of the Middle Ages, with what was taught in the universities among educated elites, which was Scholasticism and the doctrines of the Peripatetics, people believing only in logic and contradictions. Nicholas regarded the level of the senses and of understanding only as tools to put things in order. But on that level, nothing new will ever be created. The creation of the new can only occur on the level of reason, by thinking from above, thinking from a higher level, where the contradictions of the lower level are resolved. In the human intellect lies an indestructible prior knowledge, because, he says, if we did not have it, we would never seek something new, and if we discovered something, we would not know that what we found was what we had sought. Because this prior knowledge is not the result of deduction, but is really a form of intuition, of prescience, and it leads to the creativity of discovery of true universal principles in science and Classical art. Now, all human beings have a natural condition, a mettle for humanity, and in most cultures there are teachings for how to reach that level of creativity and reason, and how to overcome the barbarism of uneducated emotions and logical thinking. In Confucius there is a demand for eternal learning and self-perfection. Each human being should have the aspiration to become a junzi, a noble person devoted to the common good. In European humanism, Friedrich Schiller in my view has the deepest and most inspiring program for the perfection of mankind through aesthetical education. He proposes to educate the emotions up to the level of reason, so that each person eventually can become a beautiful soul, for whom freedom and necessity, duty and passion, are the same thing. For Schiller, universal history encompasses all humanity. The torch of culture and qualitative advancement is sometimes carried by this nation, then by that culture, but they all have potential for development, to reach a condition of world citizenship in which all original potentials of the human species will be developed. I think mankind is exactly at that point: We are at the beginning of a new era, which is within reach if we act in the right way. Mankind can reach what Krafft Ehricke called the “extraterrestrial imperative,” meaning that man can become adult. Ehricke, the German rocket scientist, had a beautiful vision of space colonization as the next natural phase of evolution in the universe. He developed very beautifully how evolution has occurred over long spans, how the development of life moved from the oceans to land; how, with the help of photosynthesis, plant life emerged on Earth; how, from amphibians and reptiles, evolution jumped to mammals, and finally to human beings; how human beings first lived on the shores of oceans and on the rivers, and then through infrastructure opened the landlocked areas of the planet. And today I can add—in the spirit of Krafft Ehricke—that the New Silk Road, now becoming the World Land-Bridge, will complete that phase of evolution by opening up all landlocked areas of the world. Ehricke also said that joint international space research and travel is the next necessary phase of the evolution of mankind in the Universe, that mankind will become a space-based species. So, I think we should be fully conscious that in this present crisis lies a tremendous opportunity to reach a new Renaissance, as significant and maybe even more significant than the change from the Middle Ages to the modern era; that if we break with the axioms of globalization, of deductive thinking, of all the things that have led to this crisis, and focus on the creativity of mankind as that which distinguishes us from other species, we can live to see—many of us can probably live to see—a world in which each child is educated universally and the normal condition of mankind is genius! By fully developing that which is human—all of the potentials of the human species, as creative composers, scientists, engineers, extraordinary people discovering answers to questions that we haven’t asked yet, like China going to the far side of the Moon—we will understand secrets of the Universe which we haven’t yet imagined. And we will become better people. I believe that the true nature of human beings is good, that every human being has a capacity for limitless self-perfection and goodness of the soul. And to accomplish that is within reach. And let’s work for it.